A number of heavy industry ﬁrms had moved into the area over the last decade. Te population growth and prosperity that came with these investments rendered the town’s administrative and recreational facilities inadequate. Town council commissioned Ojolick Associates to design a new civic centre that would address these shortcomings, bring citizens together and instill a sense of community pride. The centerpiece of the new structure was to be an arena suitable for hosting trade shows and community events, as well as the ice hockey tournaments that are so popular in the region. Designers of sports facilities constantly struggle with the desire to bring daylight into the structure. The problem is that glare invariably interferes with the athletic activities. Ice surfaces and HVAC systems are also severely challenged by the solar heating eﬀect of direct sunlight. 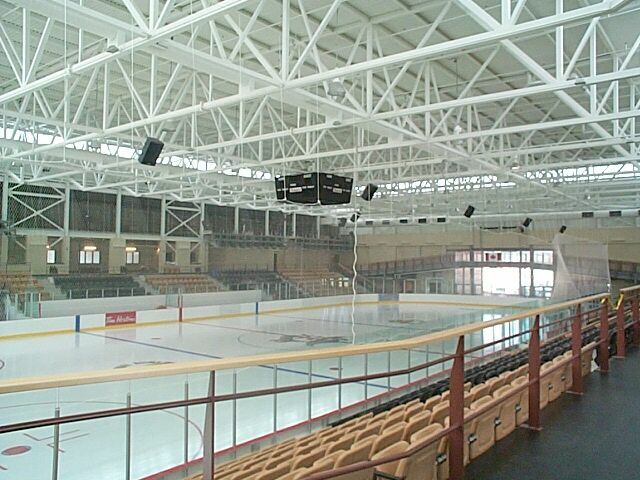 Indoor skating rinks, gymnasia, arenas and stadiums often end up as dark, cavernous structures that disconnect athletes and patrons from the world outside. Te use of expensive artiﬁcial lighting soaks up facility operating budgets, even on the sunniest of days. The Port Hawkesbury Civic Centre oﬃcially opened in January 2005. Ojolick observes that town oﬃcials are delighted with their new facility. Those who know and understand daylighting with a rational and scientiﬁc mind, know that well-daylighted buildings produce a host of positive psychological and physical beneﬁts for the people who use them. Those who don’t have that knowledge simply feel wonderful when they walk into a structure that is awash in soft daylight. Port Hawkesbury not only has a facility of note within the region…they may also be the proud owners of the ﬁrst completely daylighted enclosed arena in North America.